Farwa! Sire of Live Show champions/Multi champion/Grand champion show horses. 2001 black sabino CMK stallion. A rare BLACK sabino! Excellent halter stallion. Bloodline crosses to Count Dorsaz (3x), Count Bazy, Aurab, (2x) Hallany Mistanny (2x) and Al Marah breeding. Bred by Aspen Hill/Heidi Reaves. 1987 grey mare. Champion halter horse, Dam of live show champions. Excellent bloodlines including Silver Vanity, Sotep and Ranix. 1989 chestnut rabicano mare. Sire is CMK, dam is straight Crabbet. Currently unshown, excellent bloodlines tracing to Ramly, Abu Farwa, Serafix and Rapture. Bred by Aspen Hill Arabians. 1993 chestnut sabino mare. Sire is CMK, Dam is 100% Crabbet. Lovely old type and substance! Bloodlines to Aulani, Benraz, Raktha and Crystal King. Bred by Laurel Dedes. 1994 chestnut mare. Dam of a multi champion western performance horse. Beautiful straight Crabbet mare with excellent bloodlines including AM Count Fast, Dargee Mutlak and Bahram. Bred by Sadakat Farm. 1994 grey CMK Mare. Live show Champion, superior bloodlines including Silver Vanity, Ranix, Abu Farwa, Overlook Farwa and Aurab. 1995 grey (chestnut) Crabbet arabian mare. Unshown, lovely old bloodlines tracing to Haroun, General Gold and Crystal Magician. Bred by Persimmon Hill. 1996 grey mare. Straight Crabbet breeding with lines to Haroun, Saherin, Sindh, Silver Vanity 2x, and Blue Domino 2x. Bred by Laurel Dedes. 2001 grey CMK mare. Champion show filly, AMAHA LOM winner in halter. Bloodlines include Tut Ankh Amen, Lewisfield Sun God and Abu Farwa. Foal body as she is a real time bred Foxfire foal. 2002 Grey CMK mare. Limited showing with good results, dam is pure Crabbet breeding tracing to Saherin and Haroun, sire is CMK tracing to Aurabiz and Count Bazy. 2005 dark grey Crabbet Arabian mare. Limited showing, imported from Australia as a 3 year old. Bloodlines trace to Silwan, Sindh and Crystal Fire. Bred by Tina McDowell/Gubbera Park. 2008 chestnut Polish/CMK cross mare. Excellent show mare, bloodlines to Overlook Farwa, El Paso and Abu Farwa. Real time bred Foxfire foal so has a permanent foal body. 1992 chestnut tobiano Pinto Part Arabian stallion, at least 31/32 Arabian. Sire of a National Champion mare. Limited showing with good results. Excellent lines including Indian Magic, Monokl and Ariston. Bred by Ber Ali Farm. 2010 chestnut tobiano Pinto Part Arabian Stallion. Live show placed, Champion halter horse. Bloodlines to Muzulmanin, Haroun and Saherin. Champion! Multiple times halter champion, AMAHA ROM's in performance. crosses to *Bask, The Real McCoy, Comet and Quincy Dan. 1994 bay overo pinto mare. Unshown to date. ¾ Arabian, ¼ Paint. Excellent bloodlines tracing to Rho-Quest, Cass Ole and Doc Bar. Bred by Thundervalley Farm. 1995 bay overo Pinto Part Arabian mare. ¾ Arabian, ¼ paint. Bloodlines trace to Strike, Tryptyk Ansata Imperial and Mr Gun Smoke. Bred by Dragon Star Farms. 2000 bay tobiano Pinto Part Arabian mare. 7/8 Arabian, 1/8 paint. AMAHA National champion, AMAHA halter LOM. Excellent bloodlines including *El Paso, *Aladdinn, Wind Fortune and *Bask. Foal Body, real time bred Foxfire foal. 2000 buckskin tobiano Pinto Part Arabian mare. 15/16 Arabian, 1/16 ASB. Nice show mare and well bred with lines to Ferzon 3x, *Ansata Ibn Halima 2x, Indraff 2x and Zodiac Matador. Bred by Persimmon Hill. 2001 grey tobiano pinto Part Arabian mare. 63/64 Arabian. 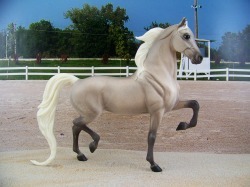 2011 AMAHA National Champion Half Arabian Gender. Bloodlines trace to Haroun, Mutlak and Shaerin. 2003 chestnut tobiano Pinto Part Arabian Mare. 63/64 Arabian. Champion show mare, bloodlines to AM Count Fast, Saherin, Dargee and Indian Flame II. 2005 rose grey tobiano Pint Part Arabian Mare. 7/8 Arabian, 1/8 Paint. Unshown, bloodlines tracing to *Etiw, *Muzulmanin, Sakr and Moon Lark. 2006 bay tobiano Pinto Part Arabian mare. Live show placed, photo show winner. Real time bred Foxfire foal so she has a permanent foal body. 2006 chestnut tobiano Pinto part Arabian mare. Photo show winner, live show placed. Real time bred Foxfire foal so she has a permanent foal body. 2007 bay tobiano Pinto Part Arabian mare. Limited showing, bloodlines to El paso, Aladdinn, Sirecho and Faaris. Real time bred Foxfire foal so she has a permanent foal body. 2007 bay overo Pinto Part Arabian mare. Limited showing, bloodlines trace to El Mundo, Strike and Ansata Imperial. Real time bred Foxfire foal so she has a permanent foal body. 2007 bay tobiano Pinto part Arabian Mare. 7/8 Arabian, 1/8 Paint. Champion Halter Mare. Live show winner, daughter of our National Champion mare. Excellent bloodlines tracing to Pepi, Fortel, Wind Fortune and Apache Dan. 1987 Palomino MORAB mare. 3/4 Arabian, 1/4 Morgan. Live show placed. 2009 MIJC Reserve National champion. 2014 MIJC National Champion Mini. Great lines, with crosses to *Sakr and Orcland Ambassador. 1988 Palomino MORAB mare. 1/2 Arab, 1/2 Morgan. Live show placed. Excellent lines, including *Muzulmanin and Futurity's Dynamite. 1989 palomino MORAB Mare. 3/4 Arabian. Champion halter mare, dam of champions. Bloodlines include *Muscat, Fadjur and Orcland Ambassador. 1990 bay Morab mare. Unshown, bloodlines tracing to Fortel, El Mudir, Meredith Bilirubin and Lippitt Moro Ashmore. Bred by VnV Stables. 1990 chestnut Morab mare. Unshown, excellent lines tracing to Overlook Farwa, Aurab, Fleetwing and Stetson. 1991 bay Morab mare. Unshown, lovely lines on both sides including Khemosabi, Tarnik, Captor and Applevale Voyager. Bred by Rocket City Stables. 1993 dapple grey Morab Mare. Unshown, excellent bloodlines including Windhover Regency, Ansata El Halim and Lancers El Shadi. Bred by Rocket City Stables. 1993 grey Morab Mare. Unshown, excellent lines including *Aladdinn, Ansata El Halim, Moro Hills Marquis and Croydon Minuteman. Bred by Shanachie Stables. 1994 grey Morab Mare. 2008 MIJC National Champion, Heavily Davenport bred on her Arabian sire’s side, Government and Lippitt breeding on the dam side. Bred by Rocket City Stables. 1998 chestnut Morab Mare. Unshown, bloodlines include Windcrest Handyman, *Bask and Karadjordje. Bred by Painted Pony Ranch. 1998 palomino Morab Mare. Unshown, bloodlines tracing to El Mundo, Naborr and Royal Fleetson. 1998 bay Morab Mare. Unshown, bloodlines tracing to Orcland Royal Don, Chopinn and Lech. 1998 chestnut Morab mare. 75% Morgan/25% Arab. Champion halter mare, excellent bloodlines tracing to Applevale Strom King, Overlook Farwa, royal Fleetson and Stetson. 1999 red dun Morab Mare. Unshown, bloodlines to Heresy, UVM Dexter, Salon and Padron. Bred by Samantha Kroese/VnV Stables. 2007 bay mare. Excellent show mare, bloodlines to El Mundo, Dramborr and Bask. Real time bred Foxfire foal so has a permanent foal body. 2008 chestnut Morab Mare. Limited showing, LSP. Bloodlines to Etiw, Muzulmanin. Real time bred Foxfire foal so has a permanent foal body. 2008 black Morab mare. Limited showing. bloodlines to El Paso, Enoss Delnores Desert Storm and Beamington. Real time bred Foxfire foal so has a permanent foal body. 2008 chestnut Morab Mare. Limited showing, bloodlines to Muzulmanin, First Echo and Moro Hills Marquis. Real time bred Foxfire foal so has a permanent foal body. 2010 palomino Morab mare. Unshown, excellent bloodlines tracing to Muzulmanin, Dramborr, Lin Kim Dancin and Royal Fleetson. Real time bred Foxfire Foal so has a permanent foal body. 2010 palomino Morab mare. Excellent show filly, bloodlines to Justin Knox, Muzulmanin El Mundo and Dramborr. Real time bred Foxfire Foal so has a permanent foal body. 2011 palomino Morab filly. Unshown, pedigree traces to Lin Kim Dancin, El Mundo and Muzulmanin. Real time bred Foxfire Foal so has a permanent foal body. 1991 buckskin NSH Mare. Champion halter mare, royal bloodlines including Fantasy Fashion, Macks Wonder Boy, Sakr and Rashad Ibn Nazeer. 1994 buckskin mare. 15/16th Arabian. Multiple times champion/Grand champion, AMAHA Halter LOM, Multiple Nationals Top Tens. Bloodlines to *Bask, Fadjur and El Minyat. Bred by Persimmon Hill. 1996 grey NSH Mare. Multi champion/Grand champion halter mare. Well bred with lines to Abu Farwa, Frosty Irish, Bold Society, Aurab and Overlook Farwa. 1997 Bay tobiano NSH mare. 75% Arabian. Unshown, excellent bloodlines tracing to *Bask, Serafix, SA-Fadjur and AM Count Pine. Bred by Ber Ali Farm. 2000 grey NSH Mare. 7/8 Arabian, 1/8 ASB. Unshown, lines tracing to Toi soldier, Arax, Salon and Nariadni. Bred by Hidden Valley Stables. 2000 palomino part Arabian mare. 31/32 Arabian, 1/32 ASB. Photo show champion, AMAHA Nationals Top Ten. Pedigree traces to Abu Farwa, Aurab, and Fadjur. 2001 palomino NSH mare. 7/8 Arabian. Multi champion show filly, AMAHA ROM/LOM winner. Excellent bloodlines including *Muzulmanin, Sadeek, Rashad Ibn Nazeer. Foal body as she is a real time bred Foxfire foal. 2007 red roan Quarab mare. Limited showing with good results, bloodlines to Genuine gold, Mr roan Hancock and Shaikh Al Badi. Real time bred foxfire foal, so has a permanent foal body. 2005 palomino Part Arabian mare. 7/8 Arabian, 1/8 Morgan. Excellent show mare, bloodlines tracing to Muscat, Raen, Muzulmanin and Orcland Ambassador. 2006 palomino Part Arabian Mare. 7/8 Arabian, 1/8 Morgan. Unshown, lovely homebred mare with lines to El Paso, Sakr and Orcland Ambassador.